Of course, it has dinosaurs. And it also has mammoths, one woolly and one … we’re not quite sure yet. But it also has … humans! The year in paleontology around the American West was full of surprises and curiosities, and so are Western Digs’ five most-read articles about fossils and natural history from 2016. One of our most read stories this year was a big exclusive about a small fragment of bone. In May, a paleontologist in Utah reported the discovery of part of a dinosaur’s ilium, or pelvic bone. Not huge news on its own, perhaps. But the expert’s analysis of the fossil revealed that the bone belonged to a juvenile member of the class of horned dinos known as ceratopsids. And given the age of the Utah rock in which it was found — over 100 million years old — the fossil may turn out to be evidence of the oldest certaposid yet found anywhere in the world. Have a look at the specimen, and see how such a small fossil can have big implications for our understanding of natural history. The mammoth is the animal Western Digs chose as its symbol, because it represents both natural history and human history; it was here before the Americas were populated by humans, but, by the time mammoths had disappeared, they had become a familiar sight to many of the first Americans. And in August, a new study revealed just how long mammoths had persisted in North America. 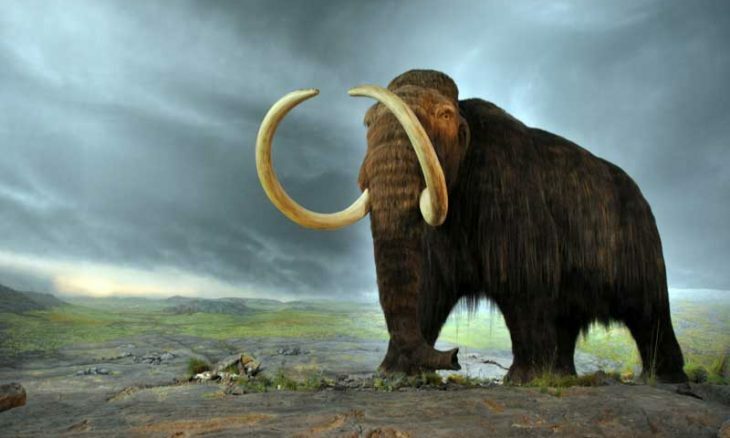 According to geoscientists from Penn State, a small population of woolly mammoths survived on a tiny island in Alaska until just 5,600 years ago — that’s nearly a thousand years longer than experts has previously believed. So, how did the scientists figure this out? Through microscopic traces of the mammoths’ DNA found in layers of ancient sediment, as well as tiny signs of the animals’ feces. Learn about the very last days of the woolly mammoth in North America, and discover how scientists explain the longevity of this iconic animal. Mammoths have been found all over the continent, from Ohio to Alaska. But this summer, archaeologists conducting a survey on the Channel Islands of the coast of southern California uncovered an unusual specimen. The skull and tusks that were found were among the best-preserved that researchers said they had ever seen. But it’s not exactly clear what kind of mammoth those bones belonged to. The most common species of mammoth found in the American fossil record is the Columbian mammoth, the giant, ginger-haired pachyderms that stood taller than modern African elephants. But the Channel Islands were also home to a unique species of pygmy mammoth, which was no more than two meters high at the shoulder and was well adapted to the scarce resources of island life. The specimen found on Santa Rosa Island appears to be too large to be a pygmy, paleontologists say, but also too small to be a Columbian. And what’s more, it has two different types of tusks. See the Santa Rosa island specimen for yourself, and learn more about the diversity of America’s lost elephants. Of course, few animals are more emblematic of the West — be it ancient or modern — than the horse. And in the fall, new research revealed what sorts of horses shared the land with some of the earliest inhabitants of the Pacific Northwest. After investigating some fossil toe bones found in Oregon’s famous Paisley Caves, a paleontologist with the serendipitous name of Brianna McHorse discovered that they belonged to a species of horse never before recorded in the region. Read on to learn about the caves, the fossils, and what they can teach us about the evolution and distribution of early American horses. Finally, the most-read natural history news of 2016 was not simply about fossils, but about how one group of pre-contact Americans appears to have used them. A paleontologist working in southern Utah was taking a break from a dinosaur dig and exploring a nearby cliff dwelling, when he made a striking find: The stone above the entryway to the building was prominently marked with the footprints of a theropod dinosaur. What’s more, experts found that the track-bearing stone came from a separate deposit than the one that provided the rest of the cliff dwelling’s building materials, suggesting to archaeologists and paleontologists alike that the stone was selected by Ancestral Puebloan architects as a kind of decoration. Learn more about the unique intersection of natural history and human history! Sincere thanks to the 1.6 million of you who visited Western Digs in the past year! If you haven’t signed up already, you can receive Western Digs by email for free, and you can follow us on Facebook, Twitter, Tumblr, and Google Plus!